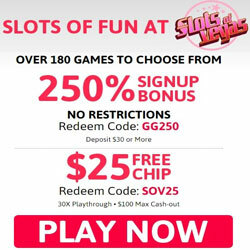 Slots of Vegas Casino Exclusive $25 Free No Deposit Bonus! Slots, Keno and Scratch Cards only! Slots of Vegas Casino has been a progressive online casino for several years now. Just recently they overhauled their business model, which turned their brand into a more secure service for players. So far, the outcome of this action has been fewer complaints from players who choose to play online casinos and games at Slots of Vegas. Give Slots of Vegas Casino a try and take advantage of Gambling Gurus Exclusive Sign Up Bonus. Just redeem this bonus code (GG250) in the cashier after you click-thru one of the links here and register your player details there! Register now, we know you are going to like what Slots of Vegas has to offer. The RTG Software Platform that Slots of Vegas Casino runs their games on is one of the oldest online gaming platforms in the online casino industry. TST (Technical Systems Testing), gave them their seal of approval that can be seen on the bottom of their website. The auditing firm TST regularly test the RTG Games to show that they’re fair and continue to play fair. Among all the cool games available at Slots of Vegas you can find three-reel and five-reel slots, themed games, a long list of table games and a comprehensive and very appealing variety of specialty games, all powered by the famous and professional game development company Real Time Gaming. Real Series Slots are the largest category of games offered at Slots of Vegas Casino. Every game has its own distinct theme and customizations implemented. Of course, the casino also offers a large selection of Video Poker Games and Table Games as well as a small selection of three-reel slots, Scratch Cards, Keno and Bingo games. Slots of Vegas Casino offers Video Poker players a large video poker selection. Their video poker games feature single-hand and multi-hand versions of the games. Games like Bonus Deuces Wild, All-American Poker, Sevens Wild, and even Pick’em Poker. Table Game players will find a good variety of tables that include: several Blackjack variations, American, French, European and Multi-player Roulette, along with games like Baccarat, Craps, Red Dog, Three Card Poker and other games. Deposit & Withdrawal Methods Include: Bank Checks, ACH, Citadel Commerce, CLICK2PAY, MasterCard, Neteller, Prepaid Cards, Visa, Bankwire, American Express, etc. Withdrawals are available by Overnight Express (Federal Express Cashier’s Check), Bankwire, and a few other methods that can take approximately 4-10 business days. This is now a typical cash-out timeline for players in the US to expect from any of the Online Casinos that accept USA Players. Slots of Vegas Casino uses 128-bit SSL encryption technology. This keeps your sensitive data secure and safe as it travels thru encrypted internet tubes to the casino network. This method is similar to what online Banks use and leaves little to no risk of your information leaking out around the Web because this encrypted data is virtually impossible to read. The RTG Software Platform that Slots of Vegas Casino runs their games on is one of the oldest online gaming platforms in the online casino industry. TST (Technical Systems Testing), gave them their seal of approval that can be seen on the bottom of their website. The auditing firm TST have tested and regularly test the RTG Games to show that they’re fair and continue to play fair. Their VIP program is divided into three categories, which offer a series of great benefits for the most enthusiastic player: Silver, Platinum and Gold VIP statuses will provide you with different percentages of monthly insurance for your games, better cash out limits, comp points and higher table limits. Last but definitely not least is the High Roller option, which is definitely a great VIP status to hold when it comes to playing at Slots of Vegas. Slots of Vegas Casino takes the time to figure out ways to reward loyal players at all times and will certainly measure up with your expectations when it comes to pampering a VIP Player! Slots of Vegas Casino provides its players with an experienced and dedicated support team that is available 24/7. If you’re in need of assistance, you can contact one of their Reps through a variety of different methods. For most inquiries, the fastest contact method is through the 24/7 live chat service that’s available through the Slots of Vegas Casino website or thru the downloaded casino client. Phone and Email support are also available thru their toll-free US phone number posted below, or by sending them an email. When you think about online casinos or USA Online Casinos there are certain things that come to mind. Many new players are concerned about how they can deposit and withdraw among many other things. At Slots of Vegas we have been assured that legitimate new players will not have to worry about deposits or withdrawals and that’s the main new focus of Slots of Vegas Casino! Keeping new players as well as existing players happy is what they’re all about. Slots of Vegas Online Casino has turned into a go to place to have fun, and it’s no longer just an online casino; it has truly become a community of online slot and casino game enthusiasts that seek big fun! As the casino has grown over the years, they are now taking the time to become a more reliable and trustworthy brand, where people from all over the world will want to sign-up and play the newest games available. They also have made sure that their players know what they are all about by opening up some very good communication channels. These new communication channels are always available for online casino players which include live assistance and many new social interaction channels. *Slots of Vegas Casino is a member of the Virtual Group of Online Casinos. This network of sites has had a prior history of slow player payments. As such, they were placed on The Gambling Gurus Rogue/Blacklist for quite some time. However, they have diligently tried to redeem themselves recently by resolving most all disputes raised against them and they’re paying players at a faster rate now. As of September 1st, 2012, Slots of Vegas Casino is no longer on TGG’s Casino Blacklist. Posted in Casino Info Articles, Gambling Articles, Las Vegas.